Community Voices: Who does the executive director of MPHA really work for? Protesters demonstrate in front of the Minneapolis Public Housing Authority offices in September. Photo courtesy of Defend Glendale. Who are Abt Associates? Clark Abt, a former Raytheon engineer and manager, started Abt Associates in Cambridge in the 1950s. Abt Associates is a for-profit consulting firm that contracts primarily with corporations, nonprofits, and governmental agencies (including the Department of Housing and Urban Development (HUD) and local Public Housing Authorities). With a revenue of $501 million in 2016, Abt Associates has close ties to both the financial and government sector. Gary Perlin, the current chair of Abt’s Board of Directors, is the former CFO of both Capital One and the World Bank, as well as the former vice president and treasurer of Fannie Mae. Abt Associates is “in the forefront of efforts to measure the condition of the public housing stock and the costs of bringing this resource up to a standard state.” According to their website, they presented some of their findings to Congress in 2011. They claim in their December 2014 report that there are $26 billion in large scale capital improvements needed for public housing across the country – this came from Meryl Finkel’s 2010 “Capital Needs in Public Housing.” Is this behind the push to Moving to Work and privatization? Jeff Lubell (director of housing and community initiatives for Abt Associates) wrote a book with Henry Cisneros, the former HUD director and defendant in Hollman v. Cisneros, which claimed that the defendant’s administration of Minneapolis public housing programs created and perpetuated racial segregation. 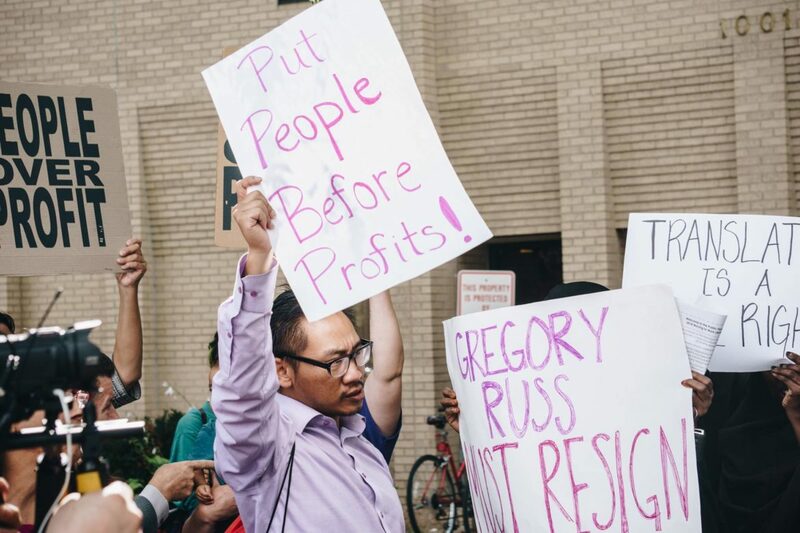 A 2015 article in the Cambridge Day highlighting a pay increase for Russ revealed that, on top of his nearly $200,000 annual salary, his contract with the Cambridge Public Housing Authority allowed him to work up to 80 hours a year as a private contractor. So who does Gregory Russ really work for? Is he accountable to the residents of MPHA, or is he working for a government contractor controlled by the same large financial interests that prey upon ordinary people and low-income families? Is Russ an agent of Wall Street and the 1 percent, or a public servant that is here to keep public housing public? The residents of MPHA, residents of Minneapolis, elected officials from City Hall and the Minnesota Legislature deserve an answer! Ladan Yusuf is a campaign organizer with Defend Glendale and Public Housing Coalition. When author and grass roots scholar and researcher Dr. Mathew Desmond spoke at Augsburg college in fall 2017 – he explained that EVICTION is not a result of poverty. In his view, EVICTION is rather a Cause of Poverty, leading to ever more crowded, unsafe, expensive and deteriorated options. Eviction triggers high risks for our most vulnerable. Desmond’s visionary solution explains that a UNIVERSAL HOUSING VOUCHER would run around 20 Billion only. While we already provide Homeowners 170 Billion in mortgage tax credits. So if you are a mostly white homeowner you too are already on a generous government subsidy. If you are a renter mostly of color…. you know whereof Matt Desmond speaks. So locally – here – now…..
Let’s demand our public servants serve the public. Let’s preserve existing deeply affordable rental units, build new affordable rental units and let us behave as the Global Village we need to be. Let us not destroy existing communities of the most vulnerable and throw together cheesy glass chrome steel and cement warehouses in new showy train zones. Let’s preserve a national model of neighborhood dwelling for 150+ post-WWll soldiers’ families returning to school and community. Next housing Viet Vets. Then Hmong refugees and now Somali immigrants. Let’s own our own history. Let’s honor our Welcoming ways and those we are honored to welcome. Let’s re-examine Gregory Russ’s true motives. Let’s take seriously the MPHA’s proven historic effort to bulldoze Glendale Townhomes. Let’s Defend GLENDALE. What happens here and now to Glendale Townhomes only predicts Russ’s plans for the privatization of all Minneapolis’ public housing; which should instead remain part of the public trust. If Russ is allowed to run rampant… Many would be harmed. Stop. Russ. Now. Resident and displaced person in the Crossroads at Penn Conversion to Le Concierge in Richfield MN in 2015. Thanks, That’s good information for the residents of MPHA and community members. Recently, tenants of buildings in Corcoran organized a block party and rally to advocate for housing rights and the formation of a tenant-owned co-operative building. Tenants renting with The Apartment Shop, owned by Stephen Frenz, experienced neglected building maintenance, including pests like roaches and mice, mold, and indoor winter temperatures as low as 45 degrees that led to health problems. At the rally, the tenants spoke out in favor of rent control and a tenant bill of rights.